April 1453. For a thousand years, the Byzantine Empire has been civilization's guardian, carrying on Rome's legacy. Now 100,000 battle-hardened Turkish warriors have surrounded the great city & are making ready to storm its mighty walls. Find the young empress - if she even exists. Stand alongside the last Roman emperor in a climactic fight to the death. Fight Vlad the Impaler, nastiest of the Sultan's allies. Meet the eastern world's most exotic temptress. Wield new weapons: Greek Fire, arquebuses & the Great Cannon. And as the Turks pour into the breaches, opportunities to hack abound. A stand-alone adventure, or use its detailed background as source material for your own campaign." "A d20 System sourecbook from a noted authority on the Viking sagas & religion, using original sources. Players take the roles of lesser gods & goddesses from the Norse pantheon, questing & performing heroic deeds worthy of a saga, in order to forestall the "Doom of the Gods," called the Ragnarok. Contains a complete system for using Norse Runic Magic, easily transferred to your campaign!" Spring, 1454. Almost five hundred years ago, Viking colonists came to Greenland. For centuries, their colony thrived on the very edge of the known world. Then they disappeared. 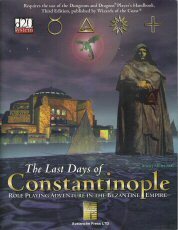 In this d20 sourcebook in the spirit of Last Days Of Constantinople, a small party of 2nd through 4th leve characters investigates the decline of Europe's most distant outpost. Face the bloodthirsty Uniped, mythical foe of explorer's. Meet the mysterious angakoks, Eskimo magic-users. And find out what has happened to the deluded, degenerate remnants of a once-great warrior people. A stand-alone adventure, or use its detailed background as source material for your own campaign!" "A land in turmoil. The Emperor is dead, his realm split into three kingdoms. Warlords, bandits and powerful families run amok. Only China's proud heroes stand between the people and utter chaos. 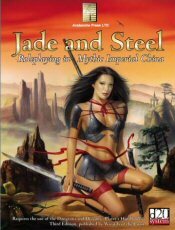 Jade & Steel is a d20 system supplement providing for high adventure in these troubled times. Add six new Chinese classes to your d20 fun: the Alchemist, Dim Mak (Touch of Death) Practitioner, Diviner, Geometer, Iron Hand Disciple, Sword Saint. Nine new feats help creat that wire-fu spirit. Is your ch'i sufficient to the task? Head for the Pearl Festival of Pai-San and find out! Cover art by noted Heavy Metal magazine artist, Lorenzo Sperlunga. d20 System compatible. For use with Dungeons & Dragons, 3rd Edition." "Legends speak of a time before history, of a great island empire wose people wielded powerful magic and technology, ruling much of the world. Their pride proved their undoing, and Atlantis sank beneath the sea in a single night. TWILIGHT OF ATANTIS is a sourcebook detailing this once-great people, drawn from the writings of Plato. New races such as the Bastai cat-warriors and the Atlanteans appear new prestige classes (Artificer, Orphean, Resonant, Spellbane) and six new feats to use with them. A whole new appraoch to magic - that of the resonance, powered by the mystical metal orichalcum - is provided, with 10 new spells. Join the adventure today, attempting to overthrow or rescue Atlantis' great empire." 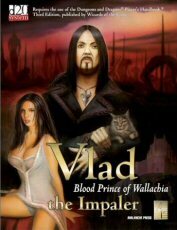 "For over 500 years, people have spoken his name in whispers: Vlad the Impaler. Prince of Wallachia. Dracula. The books and movies paint him as a monster, a madman, a destroyer of souls. The reality is worse. This d20 system sourcebook tells the real story of Wallachia s blood prince, with the real Romanian folklore that inspired Bram Stoker. Add new monsters and prestige classes from the Wallachian setting, plus an adventure featuring Vlad that is compatible with LAST DAYS OF CONSTANTINOPLE. And it all really happened." "A d20 System sourcebook expanding the RAGNAROK! TALES OF THE NORSE GODS setting. Players take the role of lesser gods and goddesses from the Norse pantheon, struggling to avert the Doom of the Gods foretold by Odin, called Ragnrok. New classes, monsters, magic items and skills help equip your character for epic struggles. Two of the Nine Worlds of Norse mythology come alive: Jotunheim, land of the frost giants, and Nidavellir, home of the dwarves. Includes an epic quest, "Bride of Grivensir," plus many plot hooks to extend your Norse campaign." "Role-Playing adventure on the REAL Seven Seas! For hundreds of years, the glamorized tales of pirates & swashbucklers have entertained fiction readers & fantasy gamers alike. Now, Avalanche Press takes your d20 System campaign to a new century of adventuring & discovery by bringing you the quintessential guidebook to role-playing Pirates & Privateers in the Caribbean of the 18th Century. Loaded for bear with historical information on life at sea, the political division of the New World, & the Atlantic Economy as well as the cargoes they stole & the colorful characters such as Mary Read & Anne Bonny that made pirates the legends they are. 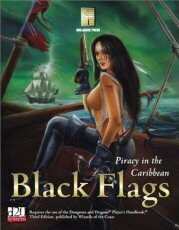 BLACK FLAGS: PIRACY IN THE CARIBBEAN includes 5 new character classes, 3 character class templates, & 4 new prestige classes. It also features a host of new feats & skills, rules for ship-to-ship combat, & a re-evaluation of firearms combat reflective of the period. Cover by famed HEAVY METAL magazine artist, Lorenzo Sperlunga. For use with the d20 System TM/Dungeons & Dragons (R), 3rd Edition." 1570 BC. The Hyksos have been cast out of Egypt and the New Kingdom begun, but the Nile Empire is in danger. Twice, the evil god Set has murdered his brother Osiris, King of the Gods. Now the gods Egypt are split into rival pantheons, waging war through their mortal Avatars. NILE EMPIRE: WAR IN HELIOPOLIS is a d20 system sourcebook on the New Kingdom of Egypt, detailing the gods, weapons, character classes, feats and skills needed to role-play in the Valley of the Kings. A bevy of new monsters appear, plus the outline for a 10-adventure campaign set amidst the war of the gods. Are you ready for the jackal-headed Anubis to lay your deeds alongside the Feather of Truth, or will your soul be condemned to feed the Destroyer?" "In Ancient England, a tyrant king holds the land in the grip of fear. With the might of a magical sword and the threatened return of a long-dead sorcerer, this fiend holds the noble, the good, and the true in his sway, squelching the will of the people and denying the claim of the rightful heir to the throne. The villain's name is Arthur. Return to a world you only think you know. 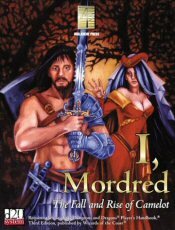 I, MORDRED returns to the original legends of King Arthur as a mad dictator, clinging to power through use of his enforcers, the Knights of the Round Table. His son, Mordred, is the rightful heir and struggles to amass an army in the name of justice to usurp his father's throne. And in the background, Arthur's wicked half-sister, Morgan le Fey, schemes to control England's ultimate destiny. This is a land crumbling in decay, desperately in search of heroes." ALL FOR ONE lets your players enter the world of Alexander Dumas, or play in the reality in which he set his famous novels. Fight as a King's Musketeer or Cardinal's Guard, or conduct secret missions as an Intendant. New rules are included for gunpowder weapons and of course no Musketeer would be complete without panache. All of the major characters of The Three Musketeers and The Man In The Iron Mask are present as well." Ree Soesbee's utterly original fictional culture of the Endless Sands draws on a combination of ancient Morocco, Middle-Eastern Persia and Antioch, and the lands of mystery outlines in the ancient tales of the Badiya people. Cities are dominated by the strong, and the weak must do whatever they can in order to survive. It is a harsh world, but if you can master it, it can be paradise." Darkness threatens the world, and with it the extinction of all life. But the Aztecs, beloved of the great god Huitzilopochtli, have the answer. With enough sacrifices, their god will gain the strength to fend off the gathering darkness and preserve humanity. AZTECS: EMPIRE OF THE DYING SUN brings you and your players to the glory of the Aztec Empire. New prestige classes like the noble Eagle Knight and the stealthy Jaguar Knights appear. The magic of the Nagual is here, and fearsome beasts like the Serpent Quetzal, the Lobison and the Guardian of the Toltecs: the mighty Chihuahua." "For centuries, the glittering cities of the Iberian Peninsula surpassed anything to be found in Christian Europe, a fact made all the more bitter because they were in the hands of the Moor. While Muslim power was strong, Christendom could do nothing but eye these lands covetously. But a lot can change in the course of centuries. Infused with a crusading spirit, the Christian kingdoms of the peninsula are now on the offensive. As the thirteenth century dawns, their dreams of victory are at hand. Reconquista is a d20 sourcebook on medieval Iberia, describing the history, culture, and societies of both the Christian and Muslim kingdoms of the region. The book also includes new feats, prestige classes, and magic items, as well as an introductory adventure: 'The Legend of the Arabian Astrologer'"
"At the time of Christ, a legendary culture was on the rise in northern Europe, Two millennia later they would he remembered for their reverence of nature, their treatment of women, and their courage in battle. Had they been allowed to expand and grow, they might have had their own Golden Age and Western culture might he very different today. Instead, they met the Romans, who eventually conquered them all. This magnificent people was the Celts, and this is their story. This volume explores their culture. Find out who they were, what they held holy, the monsters they fought — both real and mythical — why they battled each other, and what gave them joy. In addition to providing tons of detailed material on the Celts, this book allows you to bring them into your d20 campaign. 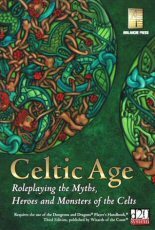 A host of new Character Classes, Feats, Skills, and other special new rules, makes this the definitive book on fantasy role-playing in the Celtic Age." "A horse is not just a horse. This supplement, compatible with any d20 campaign, allows you to customize a special mount for your character. Everything you need to know to create a legendary mount suitable to your character's heroic reputation is here. 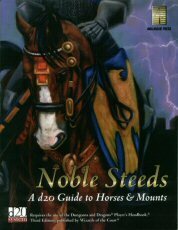 Special horse character classes, statistics by breed and type, a slew of special steed feats, new mount-oriented magic items, and information on exotic creatures such as the elephant and camel and magical ones like the Pegasus and Gryphon make this the ultimate book on your character's most faithful companion. Never ride a nameless "heavy warhorse" again. Now, your noble steed will be an important NPC and a part of your legend." ... stand a famous race of magical beings. This first supplement for CELTIC AGE examines one of the most beloved and revered classes of creatures in Western culture: the fairy. THE LITTLE PEOPLE breaks them down by region, offering a unique perspective on how fairies differed from place to place. Stats for all the famous ones you know such as Oberon, Puck, and the Leprechaun are included as well as a system for creating original fairies of your own. Not some "bold, new vision" of the fey, these are the legends as they were perceived by the people who thought fairies to be real." "Knights are larger-than-life figures of romance and steel that spark the imagination and encourage dreams. Now you can bring them to life for your d20 System campaign. NOBLE KNIGHTS features information on famous knightly orders. From the Teutonic Knights to the Knights Templar to the Knights of the Garter, history's most famous orders come alive with facts, legends, and tips for adding them to your own campaign. 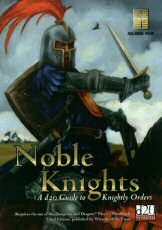 Rules for creating your own knightly orders are also included, and over 30 new knightly Magic Items round out this essential guide to chivalric adventure." "They were bloodthirsty. They were savage. And they dominated Northern Europe in the Ninth and 10th Centuries. They were the Vikings, and they had just one goal: to die heroically so that they could enter Valhalla and serve Odin in the last battle, Ragnarok. Avalanche Press brings you the most complete RPG book on Norse mythology ever. Learn about Norse culture, Viking warfare, and the special magic known as sejdr. Take the roles of a crazed berserker, a wise rune-caster, or one of the gods. Viking Age offers right new character classes, a host of new Skills and Feats, and two new magic systems. Take your d20 campaign to a whole new level of adventure, playing a Norse god trying to stave off Ragnarok. Packed with historical information and new rules, this is the definitive RPG book on Vikings and their gods - how the lived, how they fought, and, most importantly, how they died."